I am not a huge fan of the Fate series though I have been watching the shows. However, when I saw that my friend purchased a Saber Lily figure, I knew that I had to review it! 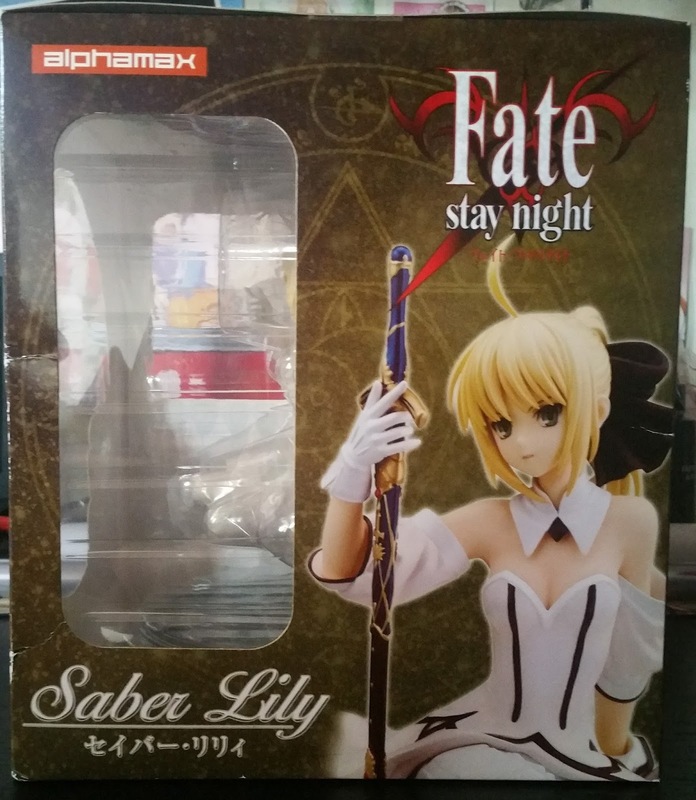 Do note that this isn't the most popular Saber Lily figures out in the market though I feel that it could pass as one of the better ones. 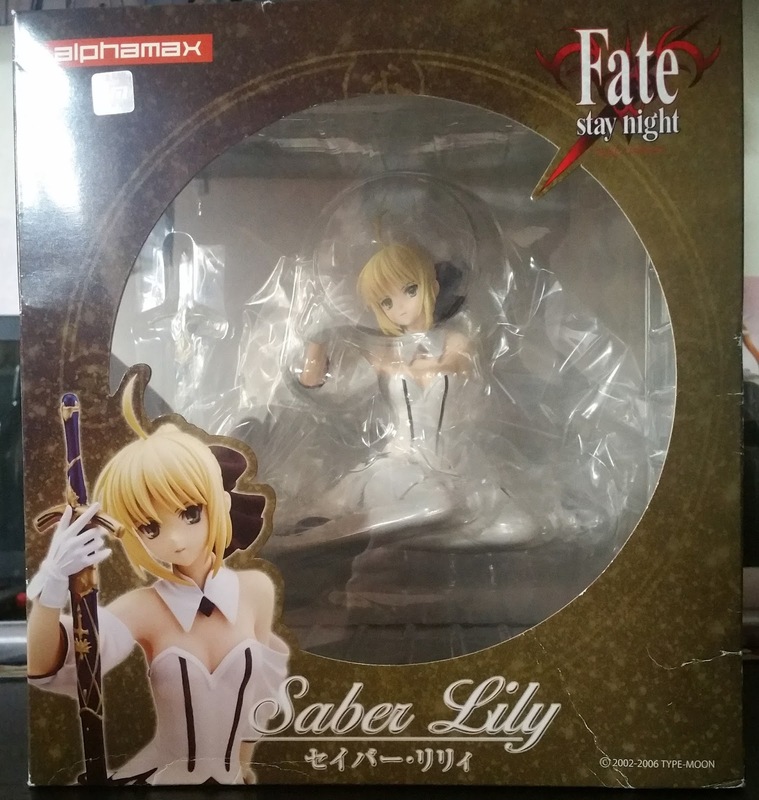 Lily's box shows her front view and with a large round window that showcases the whole figure easily. While I find this figure quite pretty, one of the shortcomings would be that this figure is sitting down which makes her height so much shorter than the other figures. 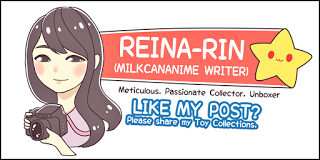 Her base is also much larger despite her shorter height. The sides of her box has windows although they do not show very much due to their position. 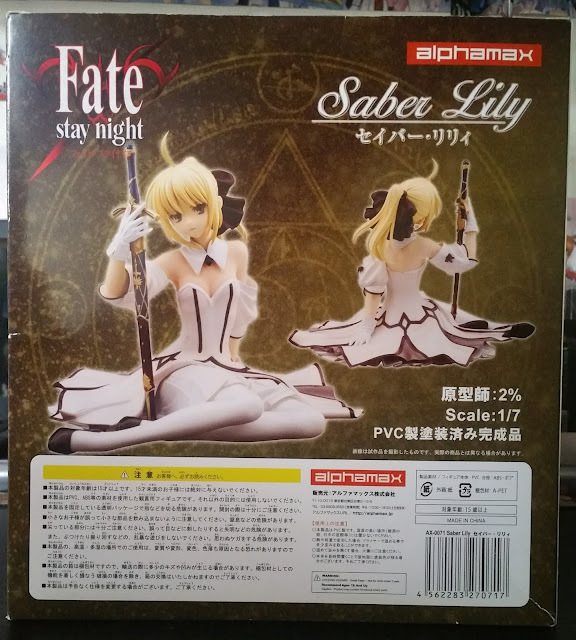 The back of her box also shows her front and back views, which are also show on both of the side panels. 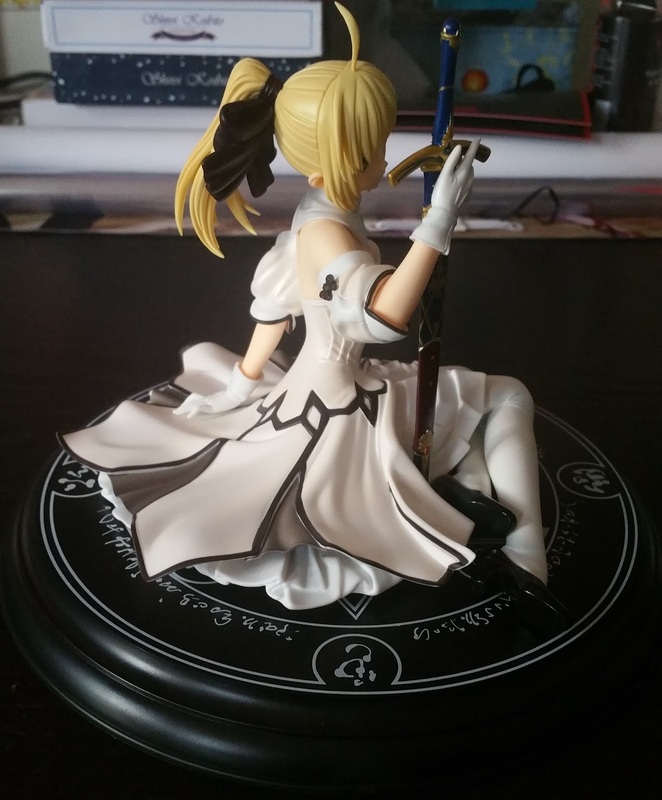 I wish that they had more variations on what the angles which they depict this figure at. Currently, it seems that they just keep featuring the same two images over and over again all around the box. 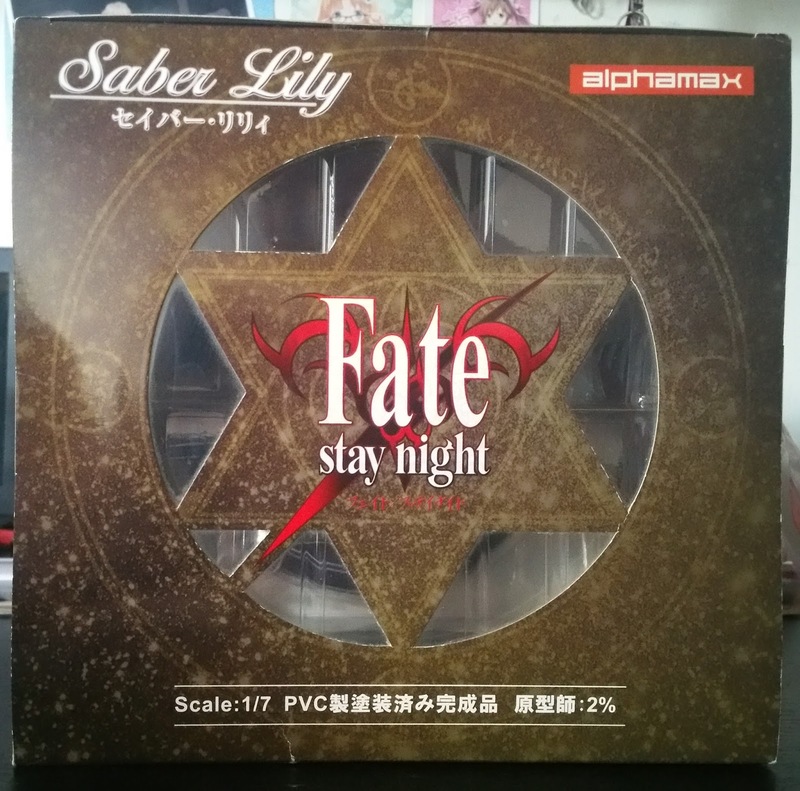 The top of the box (image below) features a star and some small windows as part of the design. 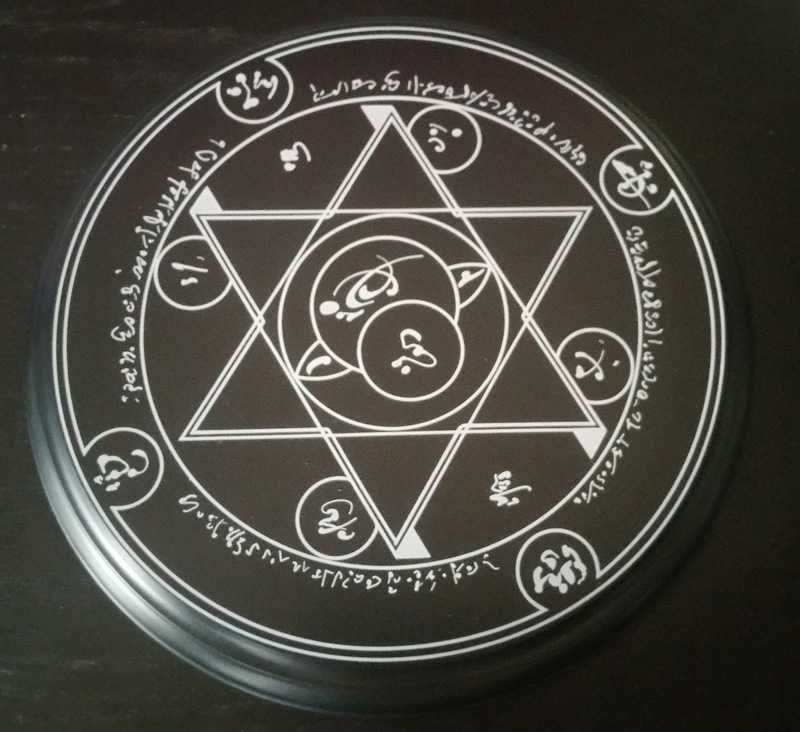 This pattern makes it look like a summoning circle, which might be exactly what they are going for. The blister is sturdy and you can see that it comes with little accessories, which is basically just the figure, base and her sword, Excalibur. The star symbol on the base is reminiscent of the pattern you see on the top of the box. 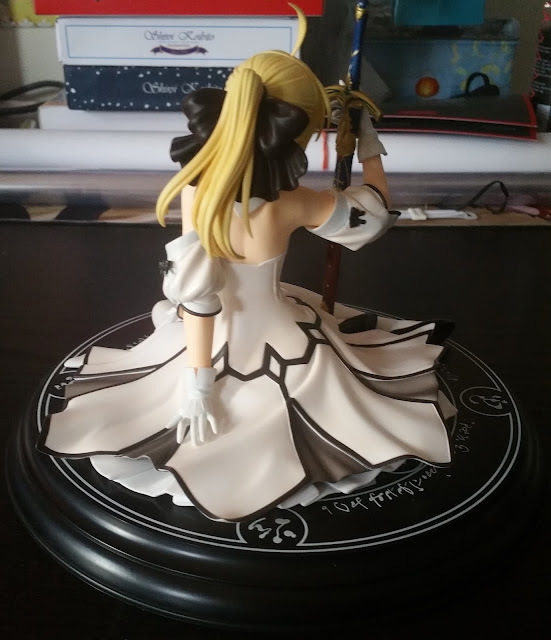 This base is basically covered when you place Lily on the base so be sure to appreciate it well before placing the figure on it. 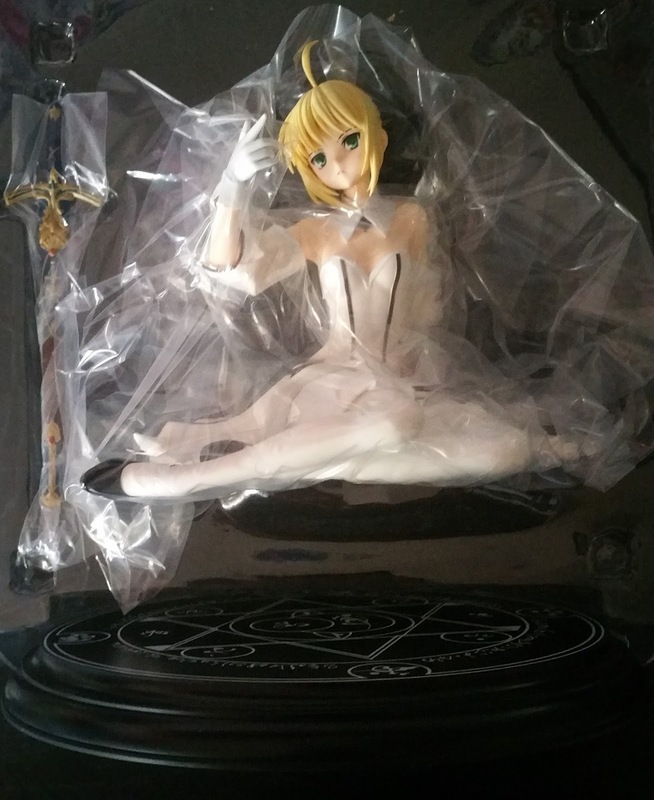 Do note that there are no pegs to put Lily on it due to her sitting pose, which keeps her stable on the base. But that also means that she might slide off the base when moving her around so do be careful. 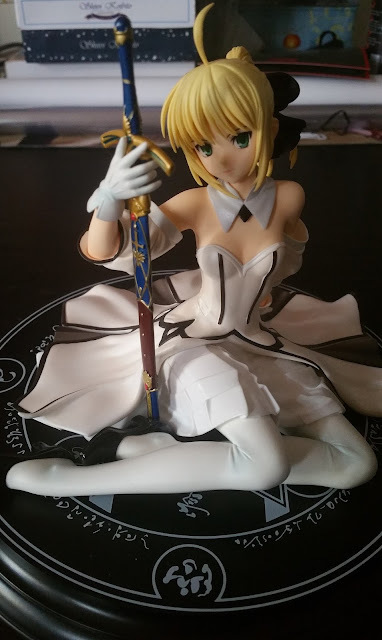 Before going into the figure itself I would like to first like to talk about Excalibur. There's all these different colors (blue and brown) and the gold helps to bring out all the different aspects of the the sword. The different streaks of gold that's sculpted and painted on to the figure adds a splash of color as well as some extra textures. One nice thing about Saber Lily is that she has a different hairstyle from the usual Saber. In this figure, you can see that the hair parts are really sculpted very intricately, with all the individual pieces. 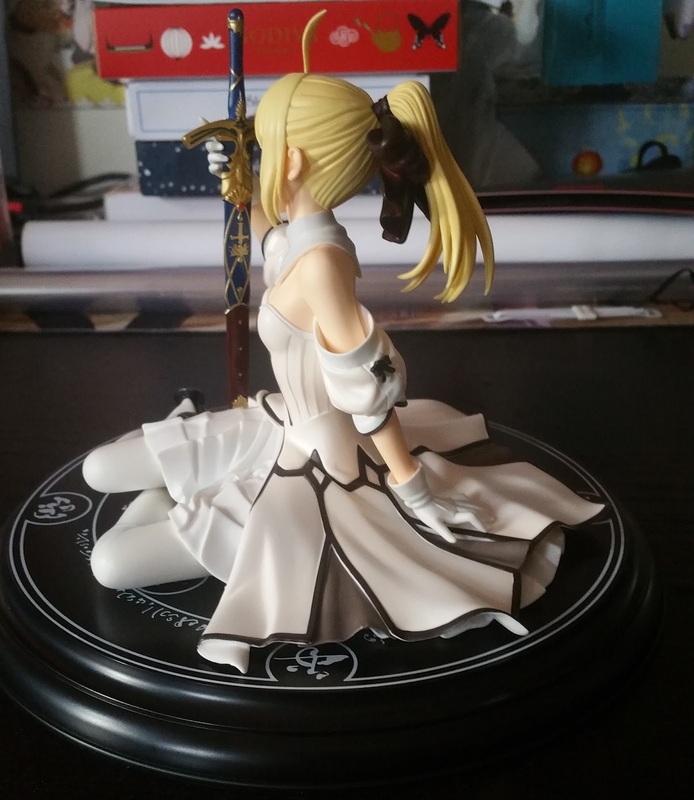 From the back, you can also see that the ribbon has a lot of creases which make it look soft. How the material loops around also helps to add a feel of dimension. Also, the dark color against her blond hair also helps it pop. It is also obvious that the shoulder blades are well sculpted, which is an additional positive point for this figure which has a the back exposed. Adequate creases are in hter outfit, creating the beautiful swirl effect of her dress around the base. The creases are even more apparent when you look at the white piece under her dress. The gradient from white to darker brown is also a very huge gap between itself and the pure white piece underneath. The loose outfit around her upper arms gives a different effect compared to the tightness around her waist. In addition, the small black ribbon at the top of the loose arm covers are really cute as well! Sorry for the bad lighting in this image. 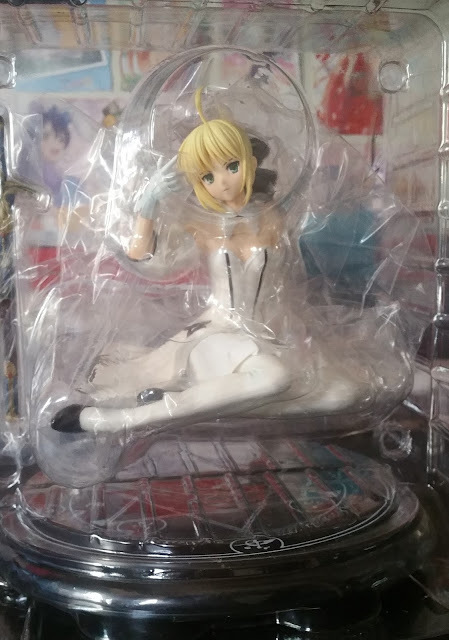 However, I would like to use this image to highlight the blue tint in Saber's gloves, neck collar and stockings. These help to add a new shade of white to the figure, making it look like there are subtle differences in color despite the main color being white. 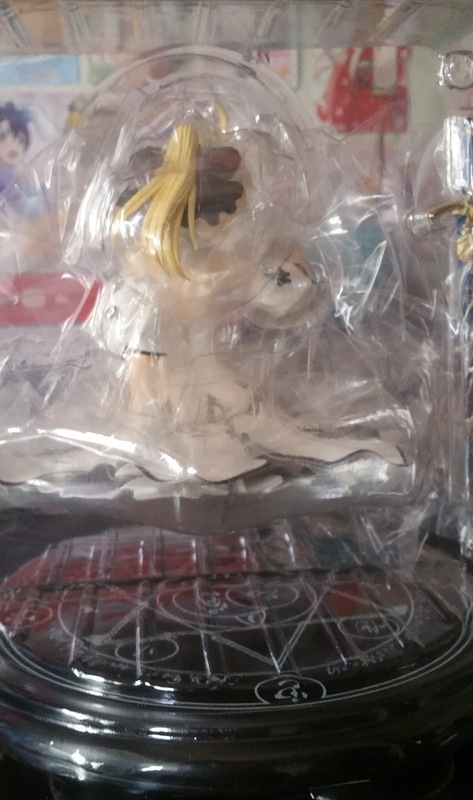 Lily's outfit also has a lot of black lines running through it and I think that it is amazing that Alphamax made sure that there are no paint spills onto the white outfit. Given the age of this figure (got it via preowned), it is amazing that Alphamax had such high standards back then already. 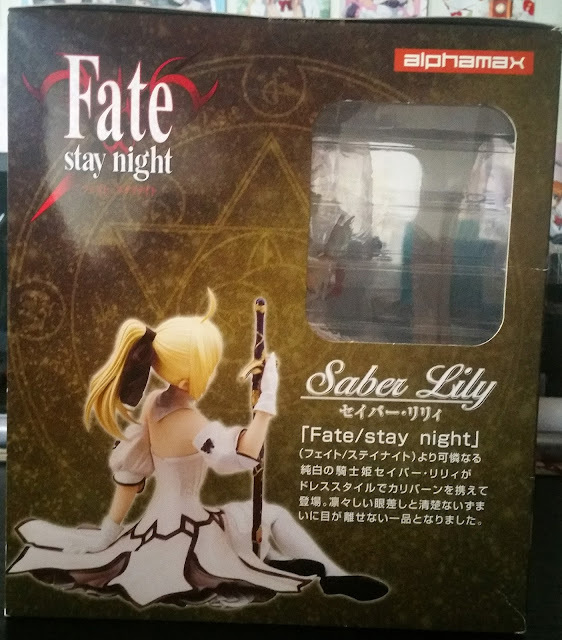 No Comment to " Figure Unboxing and Review: Saber Lily (Alphamax) "